Beautiful man, kind, gentle and full of peace. Safe journeys to your new home Mr. Mandela, we will indeed miss you here on earth. There is a lovely scene in the baseball movie “42” that depicts a young boy being initiated to racism by an adult guardian in the reinforcing midst of a hostile, like-minded crowd. But his indoctrination is abruptly short-circuited when local idol and future hall of famer Pee Wee Reese strolls over to Jackie Robinson and casually drapes a brotherly arm across his shoulder (this actually happened). The child is not innately wicked; rather he was in the process of absorbing moral precepts associated with a particular belief system, one that placed people of a different race in a subservient position in a way that was thought to reflect the proper and necessary order of things. So much mischief in this world flows from all such “morality-based” belief systems, no matter their doctrine and how virtuous they suppose themselves to be. 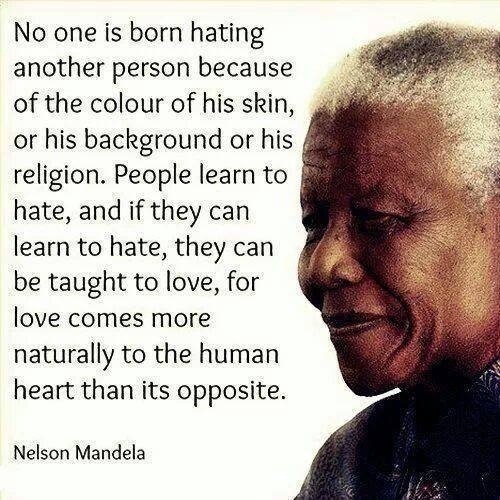 Tested by many years of hardship, Mr. Mandela seems to have come to understand this. At any rate, he certainly developed a wonderful capacity for the gentle art of laying a brotherly arm across the shoulder.